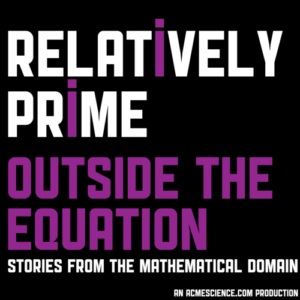 On this episode of Relatively Prime is the other panel Samuel hosted at the 2017 Joint Mathematics Meetings in Atlanta. This panel was called Outside the Equation and focused on mathematical communication outside of the typical, i.e. writing and lecture. The panel consisted of three Relatively Prime guests you already know and love: Tim Chartier, the mathematical mime, Anna Haensch, the co-host of The Other Half podcast, and Robert Schneider, singer, songwriter, and guitarist behind Apples in Stereo. If you want to know how mathematical mime goes over at a Renaissance fair or how mathematicians react to an NPR piece on Poincare conjecture or hear a logarithmic scale as played on a marimba stop reading this and press play now. If you want to hear a story featuring Samuel and an editor and number systems you must become a patron on Patreon and then you will get bonus audio for every episode, including the full audio of the Outside the Equations panel. Many thanks to the MAA, AMS, and Atlanta for the JMM where this panel was taped and to all the math loving people who came out to see it in person.